The man who had been freed from the demons begged to go with him. But Jesus sent him home, saying, "No, go back to your family, and tell them everything God has done for you." So he went all through the town proclaiming the great things Jesus had done for him. Unlike so many others to whom Jesus gives the opposite instruction, Jesus commands this man from whom he had cast out a legion of demons to go tell what happened in his life. Why? Probably because this man wasn't Jewish and the people in his family didn't have expectations of the Messiah. We can't be sure. 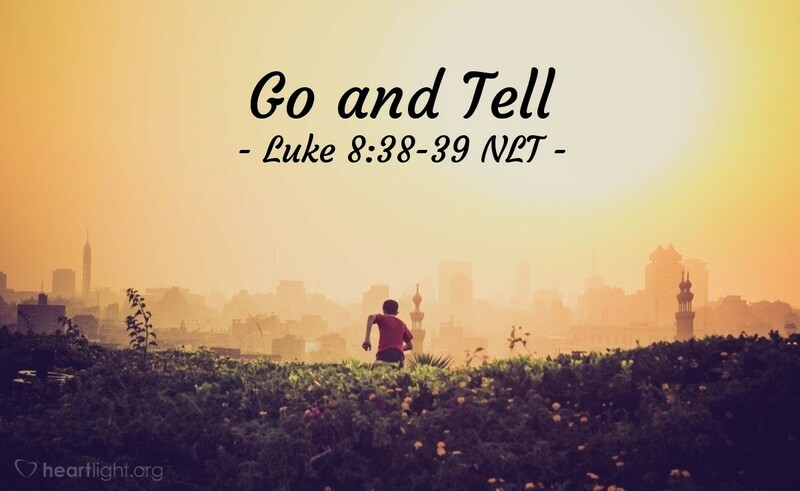 But we can be sure of this: Jesus has asked us to tell others what he has done to bless us. So let's take him seriously. Sit down and write out a page of what all Jesus has done to bless your life. Rehearse it enough to be able to share it with others when God gives you the chance. Then, begin to pray for God to open your eyes to the people around you who are waiting to hear this good news! Father, open my eyes to the people around me who are aching to receive the good news of your grace in Jesus. Please give me the words and the wisdom to share Jesus in a loving way. In his name, I pray. Amen.